The P Trap was developed as part of the drainage system for the plumbing in your home or business. The P trap will also stop sewer odors from coming back up the drain and into your bathroom. This trap has been used all of the world for many years and will continue to be.The p-trap is found in the bathroom, the kitchen, the basement, the bar and many other places in your home.Many P-trap’s can also be found in many commercial places of business. P-Traps can be found in fast food places, supermarkets, schools,hospitals, zoos, office buildings, outdoor showers at the beach and pretty much every where you can find a fixture drain. The P-trap can be found under most fixtures. Common places you will be able to see the p-trap are under both your kitchen and bathroom sink. If you have an laundry tub/sink you will be able to see the p-trap under that as well. Your shower and bathtub also use a p trap but you will or will not be able to see the actual trap. This will depend if you have a basement, crawl space or even live on a slab. If your bathroom is built on a slap you will not be able to see your p trap because it will be “inside of the slab”, which is under the bathtub or the shower pan. If you have a bathroom that is built on the first floor and you have a crawl space or a basement you will be able to see your p-trap if you go into one of those areas. The only problem you may run into is if your basement is finished, you may have to remove some Sheetrock from the basement ceiling before you can access the p-trap and the bathtub trip lever or shower pan drain. If you need to install a new fixture or possibly replace an existing p-trap, you will need to know that there is a difference when it comes to buying a p-trap. There are two different mechanical styles of the p-trap as well as a few choices of material that some p traps are made from. For example, P-traps are made from PVC, Brass, Steel, and sometimes even a rubber replacement can be found in places like Home Depot, Lowes, or a local hardware store. Depending on where, and what type of fixture you are installing or repairing will determine what type of p-trap you will need to replace. In most cases the local plumbing code will tell you what type of trap should be used in the area you are working in. These plumbing codes will also vary from state to state. So if you know a professional plumber in another state and they tell you what they use it may not be what your state requires. It is also very important to remember that just because a certain type of p-trap is install, that doesn’t mean that type is supposed to be there. In fact when many people “ticker” with there plumbing they just grab the first thing that fits and works and it gets left, they sell the house and someone else moves in, they experience problems with the trap not because its the trap, but it very well could be because of the wrong trap that was used. This is why it is very important to replace your p-trap with the proper type and style. 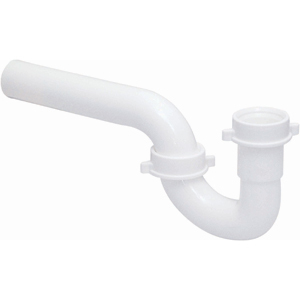 The PVC P-trap can be found in many newer homes as well as many commercial buildings. There are some advantages to the PVC P-trap like less corrosion and longer life of the p-trap fitting in the right environments. The PVC P-Trap comes in many sizes and a few different styles. The most common sizes of the p-traps that are used in homes are 1.5″ and 2″ traps. Most states require the washing machine, or the washing machine p-trap to be at least 2″ inches in size for proper draining. Most states will also require something called a “soap stack” as well that should be glued to the p-trap. If you go into the bathroom and look under your bathroom faucet you will see the common 1.5″ P-trap, now walk into the kitchen and you will find another 1.5″ or 2″ p-trap depending on your states or local county’s plumbing code. 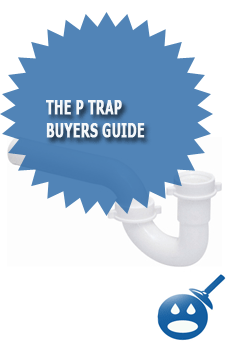 There are two different types of PVC P-Traps to choose from when you are ready to repair or replace your trap. The names of the two different types of p traps are the “swing joint p trap” and the “glue p trap”. Both kinds of these p-traps let the water flow the same way but they are different when it comes to installing them. The first type of p-trap we will talk about is the “swing joint p-trap”. 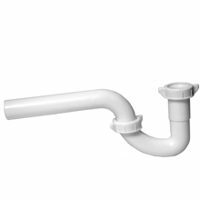 This type of p-trap is very standard in many plumbing installations because of it’s ability to be serviced after installed, and in fact in most areas, the swing joint p-trap is required by the plumbing code. The swing joint p trap which is sometimes if referred to as the tubular p trap has nuts and washers where the two parts of the trap connect to each other allowing the trap to “swing” from side to side. This is handy when installing a new sink or replacing an existing p trap. The second type of p-trap is called the “glue p trap”. The glue trap is exactly what it sounds like. It is a PVC p-trap that gets assembled and installed with glue. This type of trap is more commonly used in area where there will be no access to the trap such as shower pans and tubs that are roughed on the slabs. Unlike the swing joint or tubular p trap, this type of trap is permanently in place once the glue is applied and can not be taken apart if the trap need to be serviced. Besides the PVC p-trap there are of course other things that a p-trap can be made from. Another common material used is brass. 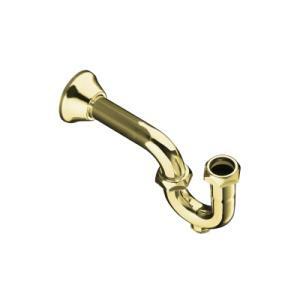 Brass comes in two different types of styles when it comes to plumbing and p-traps. There are “rough brass p-traps” and there are also “polished brass p-traps”. There is a major difference however between these two types of traps and coatings. The Rough Brass P Trap is exactly what is sounds like. Its a rough unfinished brass that is dull and boring but every effective in areas where the trap is not to be seen or noticed. This type of trap is often used in commercial bathrooms and sometimes even bathrooms in the ordinary home if there is a vanity. The Polished Brass P Trap is something a bit nicer then the standard rough brass p trap. The “polished brass p-trap” is nice and shiny and polished to look as if it was chrome. This type and style of p-trap is often used in areas where the p-trap is fully visible, for example a pedestal sink. The polished brass p trap is also more expensive then the standard rough brass trap. When you also start working with polished brass materials you need to be very careful when using tools so you do not scratch or chip the polished finish. 1) Take the trap arm and stick the non curved end into the trap adapt sticking out of the wall. You might have to loosen the trap adapt and make sure that the feral is also in line or you will not be able to get the trap arm in. 2) Once the trap arm is installed inside the trap adapt you can now hook on the U part(the trap) of your trap by tightening the nut on the trap arm to the U joint. 3) You should now have the trap arm in the wall and the U joint or the trap as its called assembled. Once you have both of those done you now should hook your drain tail piece into the top of the trap. 4) Now that all of the parts of the p-trap are connect you will want to make sure that all of the “trap nuts” or the nuts on the p trap are all tight. If your p trap is made from PVC you will want to be careful and not over tighten the trap nuts or they can strip or break. If you have a brass or tubular p trap you will want to make sure the trap nuts are tight and might even want to use some pipe dope or Rector Seal on the threads and the p trap washers. If you are tightening the Polished Brass type of p trap you will want to be extra careful that you do not scratch or chip the finish. 5) Once all of the P-Trap is connected and tighten you will want to fill the sink or the fixture up all the way and check for leaks. If you see no leaks then you have done a good job. If you have read this and feel that it is something that you can not do, then you should call a licensed plumber to repair or replace the p-trap for you. I dropped something down my sink, will it be in my p trap? Sometimes, It depends how much water is running down the sink at the time and the size of the item, If the item is really important or valuable its best to call a plumber right away! Can A Plumber Install The P Trap? The Professional plumber can be called to install your p-trap, in fact the plumber works with p-trap’s all day long and this is an easy task for the plumber. Can I Install My P Trap? You can install your own p-trap if you are some what knowledgeable with hand tools and a bit with plumbing. Replacing a p-trap is not the hardest thing to do, but it can require a few tools and some strength as well. Sometimes its just best to call a local professional plumber if you feel you can not change the p trap yourself. Is It Hard To Install A P Trap? Installing the P-trap is not hard or easy per say but will require a bit of skill like we just talked about above as well a a few hand tools. It will also take a while to change or replace if you have never done it before. If you are in a rush or short for time, your better off calling a professional. What Tools Do I Need For The P Trap Installation or Repair? To Remove and take apart most p-traps you will need just a few basic hand tools. You will need a set of channel lock pliers and some pipe dope. If you can not loosen parts of your trap with those tools, its best to call a professional plumber because the threads on the p-trap cound be frozen and then you might break something trying to remove the trap nut. We live on the eight floor of a condo building in Mexico (2 story unit) – we have 3 tubs and two of them give off terrible odors (we just moved in). One plumber said that 1 tub has a p trap but the other two don’t. We were told that the only way to correct the problem would to cut a hole in the ceiling(s) and go in that way to install them (of course the lower one would require us going through the condo ceiling below us and I’m not sure how happy those people would be about that). Is there any other way to do it? Can you come in from the side wall? Any suggestions appreciated. In the meantime I’ve taped up the drain(s) and the overflow – which has gotten rid of the smell. Also don’t want to spend all that money on getting in P traps and then find out it is another issue all together. We are in our 70s and money is not easy to come by. Thank you. It certainly does sound like the traps are missing. In some cases usually with a lack of use or, with improper venting a trap may dry out allowing sewer gases to enter. You can run some water at the tub to fill the trap if there is one then run water at another fixture nearby and see if you hear the sound of water falling in the pipes coming up out of the tub drain. That sound will not make it through a water filled p-trap. Unfortunately for you I’ll place a tall stack of chips on the no trap side of the table and consider it a safe bet. The plumbing in Mexico is notorious for being bad. This is definitely a problem you want to address, a 2003 outbreak of SARS in China was traced to a similar problem. Depending on the buildings construction access to the plumbing may or may not be accessed through the ceiling below. If you are in a wood frame constructed building chances are the ceiling below id the best access. In a larger building with cement slab floors the access is often through walls behind the tub, but may still sometimes be from below. Your plumber should have a good idea by looking at the building. Johnny, thank you for your help. We had been constantly running water as everyone kept saying that was the problem. But I figured it couldn’t be as the smell was still there after water had been run – and when flushing the toilet you could hear water running in the pipes behind the tub. We used baking soda and vinegar and it helped the smell briefly. Then we duck taped the drain and over flow – smell was gone. But we don’t want to live that way. Apparently the people below us have been having the same problem – they said it seems to come and go – which is what we were finding. Any idea how much something like that would be to fix? Coming up through the ceiling? Wishing you and your family a beaufiful weekend. It definitely sounds like a case of no p-trap. I would have no idea what trapping these 2 tubs would cost. Prices up here in Connecticut are very high and I often see where plumbers in other states are doing work for 1/2 of what we charge here. Throw down in Mexico into the mix and all I can say is it would be a lot less than what I would charge here. I have no idea! I would worry a lot more about just finding a good one that will do the job right! New P-trap, polished brass, from Lowe’s. washer between connection with slip nut. Can’t get skip nut to reach threads on curved section. Threads are fine, but with washer in there, can’t get slip nut to reach threads. Wouldn’t dream of not using washer. Have you ever heard of such a thing? Could it be poor quality? I’ll buy another, but do you think I’ll have the same problem? I also wondered if the split can be repaired by using PVC all purpose cement. I have already tried super glue and it worked wonderfully until I tighten the p trap back onto the plumbing under the bathroom sink then it split again. Hello! I am doing a bathroom remodel and learning a lot about how everything in the bathroom works, sometimes the hard way! My current dilemma is the vanity p trap needs to be replaced with one that is a bit longer to reach the new sink, however it seems the current trap is made of 2″ PVC and is glued. I am would like to replace that with a 1.5″ swing type trap which will reach the sink, but of course I can’t just swap it out. Is there a way to replace the glued trap with a screw on type, or do I have to cut the old one and re-glue in another 2″ trap? 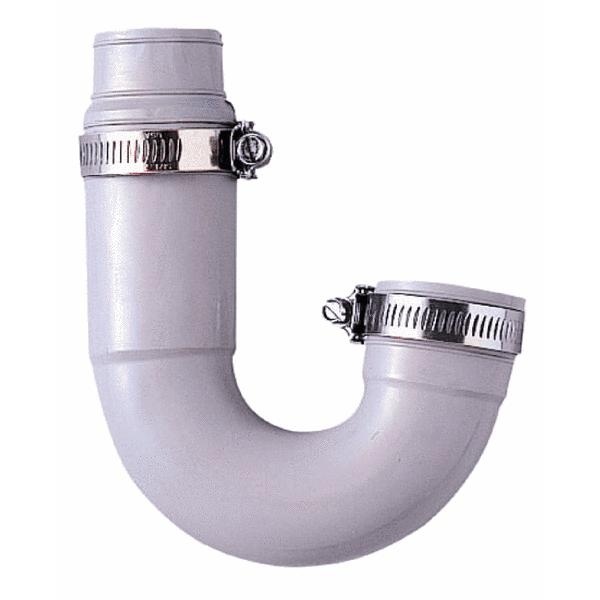 You can reduce the size by using PVC adapter to transform 2″ to 1.5″ pipe, and then connect the swing trap or swap it if you would like to. But you will have to measure how much you will have to cut the glued portion to make it clean to begin with. If it’s too short after the cut, you will have a risk of being empty handed. I’m not sure exactly why but this ebsite is loading extremely sloow for me. Is anyone else having thios issue or is it a issue on my end? We will reach out to the other side. I think Americans, Wisconsonites, will find out thaatio report is, in effect, a complete financial reference for the sector.What can the report be useding their prices.. Question for Montgomery County, Tx. concrete slab in a non-incorporated area of the county? from the elbow under the base to the p-trap? thanks in advance for the answer! I re-connected a drain line in my crawl space (basment) that came disconnected from my bathtub. No broken pipes. I now get a scent from the bathtub. The water flow from the tub is normal (good)by running water continously or filling the tub. The p-trap is level and not cracked/leaking. The drain line from the p-trap to the sewage line is level. The vent line is clear. Why would I still get a scent from the bathtub drain area ?? ?